Once again I have been lured into DIY, or whatever it is that the Yanks call it. Basically I have just demonstrated the triumph of optimism over experience yet again. I set out willingly to make a bed for the best grandson in the world. Back in the autumn a national chain of kids’ store’ announced that it was closing and that there would be a grand sale. That was when Da Boss announced our need to go and visit. Naturally I agreed, after all nothing pleases Da Boss than a shopping expedition, and what could go wrong. Well, nothing went wrong at the time, we spotted a marvellous bed that would be ideal when Boo moved out of his cot and so bought it at some wonderful discount. OK, there wasn’t a mattress or bedding but hey it was a good deal! Over the next few months we have bought at various times a mattress. bedsheets a duvet and pillows. That purchase price has now quadrupled, but what the heck. And then the minor flaw started to become apparent. The bed needed assembling! Now as you know my skills as a handyman are less than stellar. I have such a poor reputation that people have been known to leave the house or even the country when they hear that I am about to embark on some DIY. But I am not one to be fainthearted and as the arrival of Boo, our grandson, is now just a month away I decided it was time to get his bed put together. My history of disasters has encouraged me to be as methodical as possible and I even asked for the instructions that accompanied the bed before I made my first move. And folks, it was an absolute triumph. I wielded Allen keys with gusto! I even managed to replace a broken piece of dowelling with a suitable bit of wood that was just right. Basically I was completely on top of everything. Within an hour I had the main frame of the bed assembled and all this with no particularly strong language needed. I had even managed to do all of this without disturbing Da Boss and all looked plain sailing from here on in. All that was left to do was attach the wooden slats with eight screws and the morning could officially be described as brilliant. Sadly that was where things started to take a turn for the worse, and all because I was too lazy to screw those eight pesky screws in the old fashioned way with a screwdriver and a bit of elbow grease. I had been fooled by my apparent improved skill level and so decided to use an electric screwdriver for the final touches. Oh boy how foolish a move on my part. Now I think that I had better calm you down by simply giving you some extremely useful hints and tips should you ever decide to get into DIY yourself. The first thing that you need to do is make as comprehensive a list as you can of all the things that you might possibly need before you start any project. Then get them all together along with instructions, extension cables for anything powered or make sure that you have fully charged batteries for all the various handy labour saving devices you have accumulated over the years. 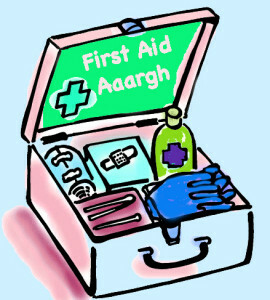 Oh, and do make sure that you have a first aid kit handy as well. There is nothing more irritating for wives and partners than you dripping blood all over the place! Unfortunately Although I had done most of this at the beginning I had neglected to include the powered screwdriver and that is where things started to go wrong. Three trips up and down the stairs, two visits to the garage and a mad rooting around in the pantry eventually turned up a cordless screwdrive r, but unfortunately that battery was flat and I could not find the charger or anything that fitted remotely to get it charged. Next stage was to resort to the drill, which had been bought purely because it doubled up as a variable speed screwdriver, so – problem solved. Well it would have been until I discovered that the lead on it was just short enough to be utterly useless, and that then meant a fruitless hunt for extension cables. By now my sunny mood had changed somewhat and small dark thunderclouds hovered in my vicinity, but fortunately I found a suitable extension cable and managed to get the first four screws into place without too much hassle. But this was when the Gods of Mischance decided things had gone too smoothly. In my efforts to stretch the extension cable I had clearly pulled the lead out of the wall socket. 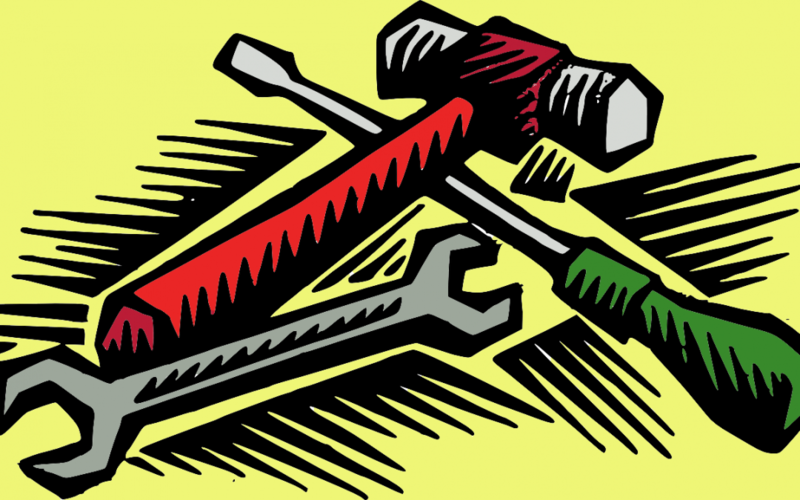 However I was not aware of that – just that my drill/screwdriver had stopped working. Eventually I tracked down the problem, but not before having switched every setting on the damned drill in an effort to make it work. But once I spotted it I was back in business and the fifth and sixth screw were soon in place. Now just for the final two and I could declare myself a Hero and slink off to the study and avoid any DIY for another few years. Oh boy, how those Gods do like to tease and torment us. The two last screws proved to be the most problematic of all. I even discovered how the first aid kit needed to include not just bandages and plasters but also lavender oil for burns. I carefully placed the second to last screw into the slot, I refrained from cursing when the screwdriver bit kept jumping out of the slotted head screw and I tried to work out why the heck it was that this screw was refusing to drill down nicely into the wood waiting for it. I checked out the base timber and sure enough there was a screw hole there, but the screw just kept on spinning and not biting. And that was when things went horribly wrong. After two or three minutes of frantic drilling I tried to pick up the screw, which turned out to be red hot. It promptly welded itself to my finger and thumb and that was when the bad language really started. Fortunately I was able to find some lavender and that took the heat out of the situation, but by now I was flummoxed by what on earth was causing these darned screws to act as though they were bewitched. It was the same piece of timber that all the others had happily been screwed into. I checked to make sure that there were no weird pieces of metal or anything unusual – but everything looked OK. I did notice that it was a bad idea to switch from normal drill to hammer drill because all that happened was the drill jumped around like a demented frog and attempted to make holes all over the rest of the bed frame, so I switched back to normal mode. I even swapped screws, but to no avail. But then I noticed one minor change to the drill, right by the trigger for controlling the speed of the drill was a little lever, and yes, dear reader I had inadvertently moved that from one side to the other. In so doing I had reversed the drill and had been happily Unscrewing for the last ten minutes. A quick flip of the switch and the job was completed within minutes. My finger and thumb will take a day or two to heal, my pride much longer, but at least Boo now has his bed. Even better I have a cast iron excuse fo doing nothing. I will simply hold up my thumb and forefinger and shake my head sadly when asked to do anything at all strenuous.